Cantheism is an ancient belief system that was given its name in 1995 by Chris Conrad. He and Mikki Norris hosted a Cantheist gathering on January 28, 2018. Mike Whitty initiated the event, and a small community of interested persons were invited to attend. Before the session began, a potluck of food was set out on a side table and a circle of seats was set out around a smaller table to facilitate items that might be handled during the service. This included an ashtray, a candle and a pipe that would be used as a talking stick. An altar was laid out with larger items that would not be handled, such as cannabis plants, photos of loved ones, hempen items, crystals and assorted items that people brought forth and chose to place there. A tray was set out and people who brought sacrament to share donated cannabis flowers into a tray. Before the session began, the donations were ground up and rolled together into a large “salad” spliff for the community to share. Nobody was required to add anything to the cannabis collection and the sacrament was freely shared, and no one was required to partake, only to handle and pass it along. The appointed time for the gathering came to pass so we gathered into a circle. Norris welcomed the congregants to participate in our gathering. A candle was lighted near an ashtray. Conrad lit the spliff from the candle flame and handed it to the left to circulate. Some people were using vaporizers rather than partaking in the shared smoke but everyone handled the spliff and passed it along. As each person received the spliff, they inhaled through the spliff or their own sacrament or simply took a deep breath and passed the cannabis to the next person. We went around the circle behind the joint with very brief introductions by name within the group, starting with Chris and working its way around to Mike, on his right. The spliff circulated several rounds. As the joint circulated, congregants began with a call out the names of people who have passed or otherwise could not be present, each name followed by the salute, “Honor them with high honor.” When the spliff arrived at Michael, he called a moment of silence and quest for spiritual connection and for each person to find their personal intention of what they want to get from the session, then spoke of his own intention for being present at the gathering. Conrad briefly summarized the concept of Cantheism as being a pantheistic or ecumenical belief system, meaning that people around the world share in the sacramental use of Cannabis. Most people who practice Cantheism do not know the name of the belief system because the incorporate sacramental use into their own personal faith or as part of an organized religion such as Rastafari or Sadhu Hinduism. He described his process of drawing Cantheist practices from ancient and modern global religions and matching them with US and State laws to establish a First Amendment religion and a 14th Amendment Creed. Since federal law proclaims that cannabis has no medical value, under that law people’s self-validated medical benefits can only be regarded as miracles, which are a tenet of religion and a manifestation of the sacred nature of cannabis. To that end, a church must have a founder, in this case Chris Conrad, who first formulated and wrote a treatise on the practice and extracted its creed in 1995 and argued for the Constitutional recognition of cantheistic religious rights. He did not, however, form a congregation. Meanwhile, other groups around the world created their own variations and practices using the umbrella of Cantheism. Conrad, in fact, gave them his blessing because cannabis is an intuitive and mystical sacrament that people experience in their own right without need for an organized church or faith to guide them to it. Certain practices are essentially universal, however, such as gathering in a circle to share the sacrament. The practice of Cantheism can be shared among people of many faiths, the only mandate is that a person must possess and consume cannabis flowers or resin as part of their practice. They need not take communion with others in the service, but they must touch the sacramental cannabis during the ceremony, at least once to pass it along. Also, some Cantheists, “chosen by the plant,” must cultivate cannabis to provide sacrament for the congregations. Conrad read through the creed and a number of small refinements were made. 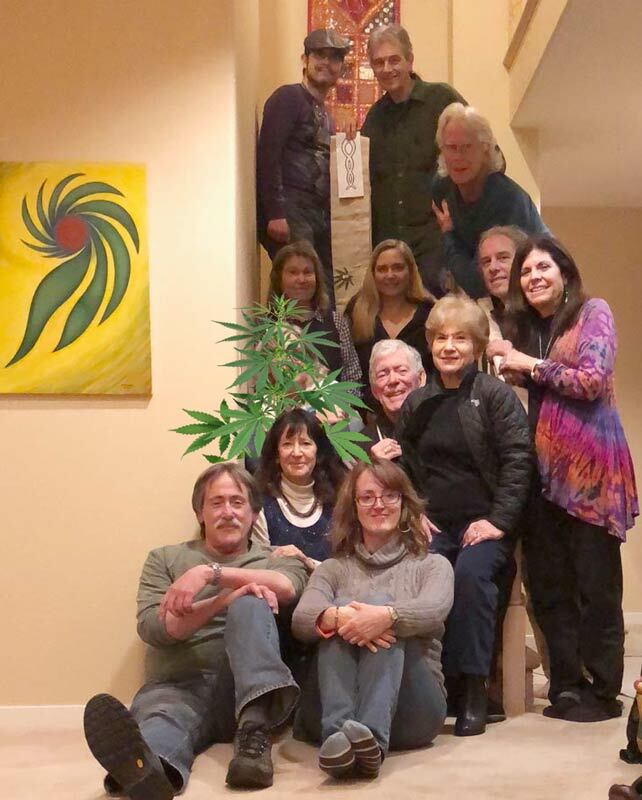 The group agreed to adopt also the alternative spelling “cannatheism,” which some felt was more clearly derived from cannabis. An altar held cannabis plants, photos of people and assorted items assembled by participants for the occasion. Some people were using other forms of cannabis during the ceremony rather than smoking the flowers, and they took a breath of fresh air and passed the spliff along to the next person. Some people who came in during the ceremony added more flowers to the salad. As the spliff continued its cycle through the congregation, a ceremonial pipe was likewise handed around clockwise through the circle for each person to make a statement about their sacramental relationship with cannabis. Others were allowed to comment but the pipe had to pass to the next person in the circle or to the next person who indicated that they would like to speak. The session began outside and at one point the weather became brisk so the group moved inside. This raised questions about how to move a Cantheist communion circle and what to do as the community circle. For example, it may become necessary to break into smaller circles, or in a large circle several spliffs might need to be lit simultaneously and smoked at the same time. The immediate choice should be organic but some guidance should also be developed to identify common rites and recognizable practices for established Cantheist congregations. Singing, music, drumming, meditation and ecstatic dance are all legitimate forms of expression for Cantheistic practices but the gathering did not attempt to formalize anything and most participants preferred minimal dogma and hierarchy. Cantheist beliefs and practices might be better characterized as an unorganized religion than an organized religion. However, many of us already incorporate sacramental cannabis into the major rites of life, such as a baptism of coming of age or enlightenment into the Cantheist faith through lighting the fire, decarboxyilzation, and inhalation of smoke or vaporization. Cannabis flowers in a wedding bouquet and the shared kiss and breath of smoke in unification. Cannabis flowers strewn in the grave at death. How far should we go in trying to formalize such rituals and services, for purposes of future adherents. The group agreed that the opening circle and passing the joint clockwise and introductions for the opening session were good practices. During the ceremony, another spliff was rolled to incorporate the cannabis that had been donated and shared in after the opening spliff. We resolved as a group to meet again and continue to establish cantheism as an active practice. To wrap up the gathering, Whitty gave a brief visualization and meditation. Everyone stood up in a tighter circle and held hands. Conrad lit the joint and it was passed in a counterclockwise direction, each person took the joint, said “Inhale and pass it along” and handed the spliff to the next person, who replied “Cánnamaste.” When the spliff got back to where it began, the circle disbanded until its next gathering. The leftover cannabis salad was set aside to begin the next ceremony’s spliff and start the next salad in a perpetual mixture of flowers. Participants then went on to enjoy the potluck with enhanced experience of tasting foods and sharing time with like-minded others.